Who’s Offering Children’s Information on the Internet? The Society of the Query Reader and Magazine were published in 2014 by the Institute of Network Cultures. Order a copy of the print book, read online, or download the pdf for free! You can also read the Introduction Reflect and Act on the blog. About the book: Looking up something online is one of the most common applications of the web. Whether with a laptop or smartphone, we search the web from wherever we are, at any given moment. ‘Googling’ has become so entwined in our daily routines that we rarely question it. However, search engines such as Google or Bing determine what part of the web we get to see, shaping our knowledge and perceptions of the world. But there is a world beyond Google – geographically, culturally, and technologically. The Society of the Query network was founded in 2009 to delve into the larger societal and cultural consequences that are triggered by search technology. In this Reader, which is published after two conferences held in Amsterdam in 2009 and 2013, twenty authors – new media scholars, historians, computer scientists, and artists – try to answer a number of pressing questions about online search. What are the foundations of web search? What ideologies and assumptions are inscribed in search engine algorithms? What solution can be formulated to deal with Google’s monopoly in the future? Are alternatives to Google even thinkable? What influence does online search have on education practices? How do artists use the abundance of data that search engines provide in their creative work? By bringing researchers together from a variety of relevant disciplines, we aim at opening up new perspectives on the Society of the Query. Contributors: Aharon Amir, Vito Campanelli, Dave Crusoe, Angela Daly, Vicențiu Dîngă, Martin Feuz, Ulrich Gehmann, Olivier Glassey, Richard Graham, Mél Hogan, Ippolita, Kylie Jarrett, Min Jiang, Anna Jobin, Phil Jones, Simon Knight, Dirk Lewandowski, M.E. Luka, Astrid Mager, Martina Mahnke, Andrea Miconi, Jacob Ørmen, Martin Reiche, Amanda Scardamaglia, Anton Tanter, and Emma Uprichard. Colophon: Editors: René König and Miriam Rasch. Copy-editing: Morgan Currie. Design: Katja van Stiphout. Cover Design: Studio Inherent. Printer: Tuijtel, Hardinxveld-Giessendam. Publisher: Institute of Network Cultures, Amsterdam. Supported by: Amsterdam University of Applied Sciences (Hogeschool van Amsterdam), Amsterdam Creative Industries Publishing, and Stichting Democratie en Media. 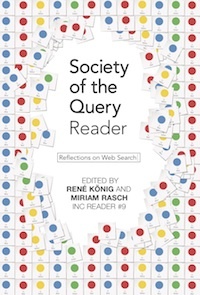 René König and Miriam Rasch (eds), Society of the Query Reader: Reflections on Web Search, Amsterdam: Institute of Network Cultures, 2014. ISBN: 978-90-818575-8-1, paperback, 292 pages.